Integrate physics/biology in this HS diffraction lab that lets students model the work of Rosalind Franklin in discovering the structure of DNA. Want to shake up your middle school Energy Unit? Try this AAPT lesson, where students play the role of "Energy Actors" to gain insight into how energy moves and changes form. Physlet Physics Section 1 (Mechanics) is now mobile and tablet-friendly! 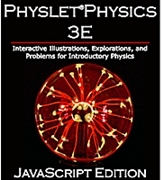 Each chapter features three resource types: Illustrations, Explorations, and Simulation-Based Problems. Newer HTML5 simulation by PhET introduces learners to Faraday's Law as they move a magnet through large and small coils. Great for beginners! Interactive lesson blends a mobile phone oscilloscope app with a digital wave grapher to explore human voice patterns. This lesson blends physics and Earth Science as students explore star spectra using a physical model made of balloons and buttons. 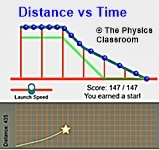 Try this newer interactive from The Physics Classroom. Can you build a ramp with the right configurations to match the given Position vs Time or Velocity vs Time graph? As you earn stars for correctly designing the ramps, you will be learning how why p/t and v/t graphs appear as they do. HUGELY fun activity to introduce younger kids to electric circuits. "Squishy" dough is quickly made from scratch. Start with a simple series circuit and go creative! This PhET favorite has been rewritten to HTML5. Learn about variables that affect interactions among charged bodies by dragging + or - charges onto the field. You can view voltage values, plot equipotential lines, and more. Analyze frequency, amplitude, and wavelength with this very high-resolution video. Use the overlay tools for measurement.